Unusual choice of business partner, Columbia Nippon, but perhaps all the other major Japanese manufacturers like King, Toshiba and RCA already had established rival networks and Columbia was available. In 1979 ABC Records and its Impulse! label was sold to MCA Records, whose partner in Japan was Victor. 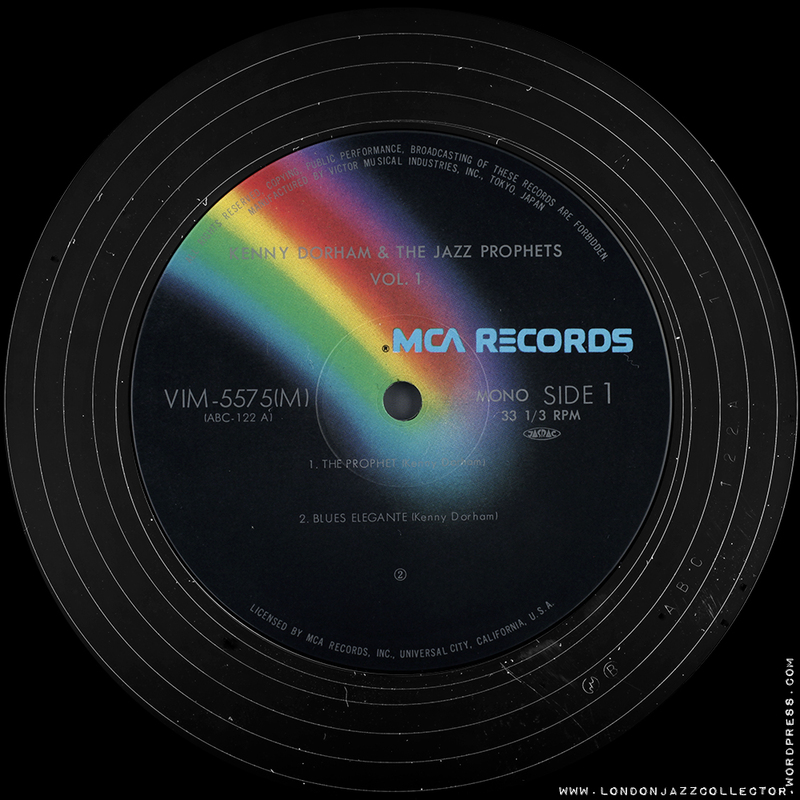 Hence it looks likely that any eighties reissues of ABC’s labels would emerge like this ABC title, on a variation of the US MCA sky with black/rainbow design. I much prefer the later Victor pressings. The Nippon Columbia discs I’ve heard have all had a really bright and edgy treble response that is really fatiguing. I scored a 1976 Nippon Columbia pressing of ‘Coltrane’ (YS-8502-AI) recently – superb sound. very happy with it; nice, hefty gatefold sleeve too. Been devouring the wonderful insight on this blog, so first off: Thanks! Secondly, given the poor reputation of ’70s US Impulse pressings, should I be looking for Japanese pressings of records from that era instead? I’m thinking of Marion Brown, Archie Shepp and the like. As you correctly surmise, Japanese Impulse reissues are not something we have seen often, if at all in Europe. I count 67 Impulse recordings, of which around half are HMV first UK release, the other half US Impulse, and no Japanese, so I can’t really compare sound. You say you have had some poor experience with Impulse. I have found little to fault in US issues up to 1966, but variable quality thereafter. Its difficult to explain, but the poorer experience seems to correlate with the gradual drift away from Rudy Van Gelder, patronising lesser studios and engineers, and using a wider spread of pressing plants, until eventually industry standards dropped to reduce cost at the expense of quality. I have only one US Impulse pressed with recycled vinyl, but a few that lack the expected vitality, so something was afoot. The quality of later issues and reissues of US Impulse from the late ’60s onwards – black/neon and green bullseye, and then MCA – is variable to say the least and nothing compared to the glories of earlier pressings. I would probably settle for Japanese over those later pressings. Victor are good, and I can’t imagine Columbia allowing their recordings to be compromised by poor manufacture, so on trust, probably good. The Japan king are highly revered as a nice alternative to original pressings of Blue Note. How are the Japanese Impulse as far as sound quality goes? Maybe these do not get as much discussion because the US Impulse original pressings can be had for cheap… but of the several dozen original pressings I have they are mostly pressed on cheap vinyl.